Jake gave Jimmie a questioning glance. Chapter 19 / Page 109 from One Light Coming: A Biker’s Story (Book 3 in a series published by Blockhead City Press released on 1 October 2011. Available through Amazon.com, B&N.com, iTunes Library, and bookstores everywhere. 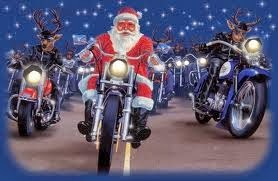 In the spirit of the Holiday’s I wondered if Biker’s did a Christmas ‘family’ newsletter, what would it read like? The snow has fallen and the roads are packed with Citizens in Cages rushing around trying to out do last year’s present to be top of the Sh*t Heap of Opinion for a day, but for the rest of us, it means moving that big powerful machine into the living room for the next few months until the weather warms up to at least 40 degrees when we get to ride again! I wanted to catch you up with our goings on, in case you missed anything due to a drunken haze or a state sponsored vacation at The Gray Bar Hotel. The Club has been busy all year. But, of course, you know that and you know that I won’t talk about it to anyone, not even my probation officer or any other LEO that drags me back down to the station for one of ‘those’ chats. Don’t ask if you don’t know, because you won’t get an answer. Now go screw off, on that subject. On the upside, all the mods made to my scooter in the Spring proved fantastic. I was able to hit the highways and stay at 85mph with revs hanging out in the 3500 range for hours. ; which made trips to the border a breeze! That larger gas tanks chopped from that stolen bike extended the range between fill ups made every ride so much better. Sturgis, Laconia, The Horse Smoke Out and The VOO were the public outings/trips made this year, and much fun was had. As for the kids, well, they are all doing pretty well. Only Angel is a disappointment. She doesn’t interact well with her step-siblings and spends way too much time at school. I suppose that Valedictorian is something to be proud of, and we are, but I just don’t understand why a scholarship to CalTech all the way in California is something to cry over. I mean, I almost cried when I found out her going was fully paid for, but still! Jason may be out of Juvie for the Holidays, if he can stop beating the sh*t out of the guards, but I’m not expecting much. Albert is our pride and joy. He’s doing really well in automotive training at the VoTech HS so at least he’ll have a way of making a living in this crazy world, if he decides to graduate. As you know, due to the latest success with my ‘pharmaceutical investments’, I finally have purchased a house of my own. Although I did have a ‘heavy discussion’ with the real estate agent that I didn’t consider living near the marsh the same thing as ‘water views’. But it is mine, nonetheless. So no more dealing with landlords that don’t speak English and rat trap apartments. Moving 3 times in one year is enough! There’s not much parking, but the new bar I built in the basement is always open, so come on down!!!!! In closing, I want to wish you all, lots of partying, and peace during the Holiday Season. Steer clear of the Boys in Blue and the Bastards in Black (DEA, ATF, FBI, and so on and so on). Take no prisoners, put up with no Sh*t, and I’ll see you all at Church next week or on the Road in the Spring.